Location: Situated approximately halfway between Caernarfon and Y Felinheli, on the SE side of the A487 and opposite the entrance to Griffiths Cross Industrial Estate. 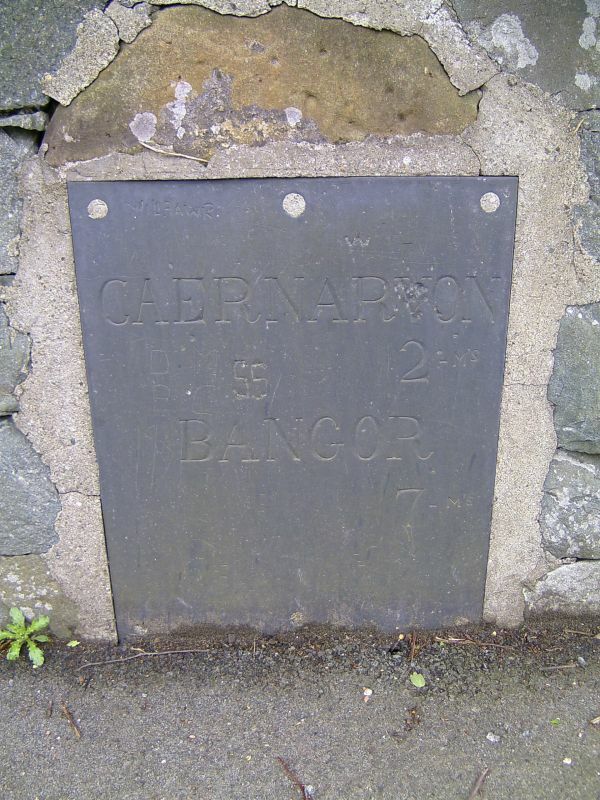 Slate plaque milestone, probably C19. Included for its historic interest as a survival of early road transport in the region. Situated immediately adjacent to the Menai Strait, down a minor road off the A487 roundabout S of Y Felinheli. Situated on the summit of a knoll some 300m SW of Llanfair Hall and some 600m E of the Church of Saint Mary at Llanfair-is-gaer. Set back on embankment to left of and above the coach-house, on south-east side of service courtyard; reached by stone steps at right end of coach-house. Detached range on south-east side of service courtyard. Llanfair Hall is in its own grounds beside the Menai Strait, between Y Felinheli and Caernarfon. On the E side of the house. Curving ha-ha wall to the E and S of Llanidan House, enclosing the garden. In its own grounds and reached by private drive from the N through the grounds of Plas Bererton.